Amazon, the world's largest online retailer, is testing unmanned drones to deliver goods to customers, Chief Executive Jeff Bezos says. The drones, called Octocopters, could deliver packages weighing up to 2.3kg to customers within 30 minutes of them placing the order, he said. However, he added that it could take up to five years for the service to start. The US Federal Aviation Administration is yet to approve the use of unmanned drones for civilian purposes. "I know this looks like science fiction, but it's not," Mr Bezos told CBS television's 60 Minutes programme. "We can do half-hour delivery... and we can carry objects, we think, up to five pounds (2.3kg), which covers 86% of the items that we deliver." The service will be called Prime Air and comes as Amazon is looking to improve its efficiency to boost growth. Amazon also posted a video on its website showing a drone picking up a package from one of its warehouses and delivering it to the doorstep of a customer's house. However, it still has to wait for permission from US regulators. The US Federal Aviation Administration (FAA) has approved the use of drones for police and government agencies, issuing about 1,400 permits over the past several years. Civilian air space is expected to be opened up to all kinds of drones in the US by 2015 and in Europe by 2016. Existing regulations are in place to minimise the risk of injury to people on the ground, said Dr Darren Ansell, an expert on unmanned aerial vehicles (UAV) from the University of Central Lancashire. "The UAVs do not currently have the awareness of their environment to be able to avoid flying into people. 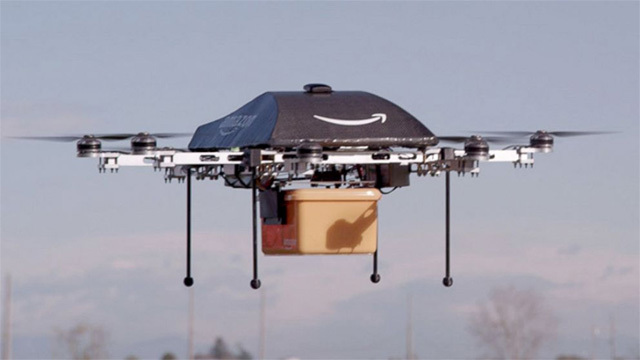 To deliver goods to people's homes for example in residential areas, the UAVs must overfly densely populated towns and cities, something that today's regulations prevent. "Other things to consider are security of the goods during the transit. With no one to guard them the aircraft and package could be captured and stolen," he said. Amazon said: "from a technology point of view, we'll be ready to enter commercial operations as soon as the necessary regulations are in place." The FAA was "actively working on rules for unmanned aerial vehicles", the company said, adding that it hoped the green light would be given as early as 2015. "One day, Prime Air vehicles will be as normal as seeing mail trucks on the road today." Zookal, an Australian textbook rental company, announced earlier this year that it would start using drones to make deliveries from 2015 if approved by Australia's Civil Aviation Safety Authority. Australian law allows the use of unmanned aircraft for commercial use.